Keywords are defined as phrases that determine when and where your ad is going to appear. The keywords should match the phrase a user has typed into a search engine. This way, the search engines relate the phrase and look for the ads that are closely related to the phrase that is used in the search query. Keywords are an essential part of creating ads with Google AdWords and using paid reach, but they are also an important element of search engine optimization, i.e. organic reach. In order to help your ad appear in the search queries related to your business, you have to use keywords that match those queries best. You will provide a list of keywords within your Google AdWords account and you will set up cost per click (CPC), i.e. the amount of money you are willing to pay for a click on those keywords. When it comes to Google Search and Google Partner sites, the ads are being displayed based on the search query. Therefore, the ads that will appear are closely related to the search query. If you use Google Display Network for advertising, Google will display the ads with keywords that match the content of the webpage on which the ad is being displayed. Since the idea with the advertising is to attract people who are interested in your business, in order to convert them to your customers, you need to use keywords that are actually related to your business. If you own an online shop which sells equipment for tennis players, you need to use keywords that are related to tennis in order to reach your potential customers. It is useless to provide unrelated keywords, as you will see no profit from such campaign. In order to fully understand how keywords work, you should also understand keyword matching options. Matching options are used with the keywords in the ads to control where the search engine is going to display the ad. This can help you limit your target audience and increase the efficiency of your ads, in order to maximize the potential of your campaign. However, choosing inadequate matching option may limit your campaign and thus have negative effect on its performance. This is why you have to monitor the keywords and find out which matching option produces best results. For example, if you use keyword phrase “tennis equipment” in your AdWords campaign, you should determine whether you want to target this phrase exclusively, or you want to add phrases such as “equipment for tennis”, “buy tennis equipment online”, etc. You are able to determine this, using different matching options for the keyword. There are five matching options to choose from. If you choose broad match, apart from the exact match of the phrase, your ad will appear in the searches including synonyms, relevant variations and misspelled words. This is basically the most comprehensive matching type you can choose, as it includes a lot of variations. Therefore, your ad will be displayed when someone looks for “equipment for tennis” (relevant variation), “tennis equipement” (misspelled word), etc. This option is set by default when you create a campaign. Broad match is recommended when you do not want to invest a lot of time in creating a list of keywords to be used as exact match. If you use broad match in your campaign, you should use negative keywords to avoid your ad being shown in the irrelevant searches and thus gaining a lot of visitors you will not be able to convert. If you want to add a modifier, you should use the plus sign on your keyboard (+) before the keyword. For example, you can type +tennis, +equipment. When you choose broad match modifier option, your ad will not be shown for synonyms or related searches. Instead, it will only appear when a search query consists of modified terms you specified in the campaign settings. You should use broad match modifier if you want to increase the relevancy of the search queries to your ad, but this will also result in less traffic than if you were using the broad match. Choosing phrase match option allows you to target users who are searching for the exact keyword or phrase. Your ad will also reach people who are using the keyword or phrase with additional words before or after the phrase. You should use quotation marks for the phrase you want to use in the phrase match. If you use a phrase such as “tennis equipment”, your ad will be shown to the users who are searching for this phrase, as well as to the users who type “buy tennis equipment” or “tennis equipment for kids”. You should use this option if you want to increase targeting options and narrow down your target group. Even though this reduces the volume of traffic you are going to receive, it will help with reaching relevant customers, which will further help you increase conversions. Exact match option is used when you want the ad to appear only when someone searches for the exact keyword. In this case you do not want to include any modifiers or additional words in the keyword list, and that way you exclude all related search queries. You should surround keyword with brackets, for example [tennis equipment]. With exact match option, your ad will only appear when the users type the exact phrase from the brackets, and the ad will not show when users type “buy tennis equipment” or “tennis equipment for kids”. You should use this option if you want to closely target your ads, but you should have in mind that this will significantly reduce the number of users who will get to see your ad. Negative match is used when you want to prevent the ad from showing up for certain terms. Use a minus sign (-) before the words you want to exclude. You should be careful when choosing the negative match, as you should only exclude the keywords when you are completely certain that you do not want your ad to appear for those searches. You should also have in mind that the ad might appear for synonyms or other variations of the negative match. It is recommended to use negative match to filter traffic and prevent the ad to appear in unrelated searches, and thus reduce the amount of unwanted clicks. General recommendation by Google is to use negative match in order to prevent your ad appearing for searches that will not result in conversions. For example, if you sell a product or service, you should use a keyword “free” as a negative match, as those who are just looking for a free version of that product or service are unlikely to become your customers. Besides “free”, words such as “course”, “class”, or “job” might also be considered as negative keywords, depending on your company. Understanding the difference between these matching options is important as those allow you to control who will be able to see your ad. While broad match option will show your ad when people search the actual word, as well as misspelled word and different word order, phrase match will only show your ad when the actual keyword is searched for. The first option tends to get more extensive as it expands the target group and the number of searches becomes significantly larger. On the other hand, the second option provides better control over the costs as it helps you limit who can see the ads, but it generates fewer clicks as it reduces the volume of searches. If you are in a dilemma which of these matching options to use, Google recommends starting with broad match as it helps you maximize the potential of your ad showing in the search results. However, you should closely monitor the campaign in order to determine if that option is the best one. In case you are running several ad groups, try using different matching options so that you can compare the results. Once you have organized several campaigns you will have enough experience to use your common sense to decide which keyword phrase should be used combined with a certain matching option. Ultimately, choosing the relevant matching option will help you improve ROI. Keyword research is the starting point of search engine marketing, which also includes Google AdWords campaigns. Nonetheless, keyword research is something you should be focused on along the way, as it can help you monitor the situation with your campaign, as well as monitor the situation on the internet. Since the situation on the internet changes constantly, monitoring is important if you want to work on the website positioning. As said before, keyword research is the essential part of search engine marketing, which is why you should conduct a keyword research regardless which of the two types of reach you want to use, paid or organic reach. In both cases, you need to know which keywords you should use in order to increase ranking of a website. Even though the process of positioning is different, selection of keywords is the same with both types of search engine marketing. There are several parts of the keyword process, which allow you to create a comprehensive list of keywords using different methods. You should also have in mind that you must not focus on a single keyword, but your strategy has to be focused on a well-picked list of relevant keywords and keyword phrases. The first part of the keyword research is brainstorming. Create a list of all the keywords using your common sense. Put down all the things that come to your mind when you think about your company and your product. Try to predict what people will search for, that might help them reach you. The second part is to go to your website and look for the most distinctive and the most relevant keywords. Since at this point, when you intend to create an AdWords campaign, you probably already have a website, where you have a certain amount of content, you should explore the website, find the relevant keywords and keyword phrases, and add them to the list. The third part of the keyword research, which will help you expand the list even further, is to explore the website of your competitors. This will help you find out which keyword are used by the people who work in the same industry which is good for getting a different perspective. Furthermore, it will help you expand your list with relevant keywords that might help with shaping your campaign. The next part of the keyword research consists of several actions that will help you evaluate the efficiency of the keywords from your list and reduce it to the most relevant keywords that are most likely to achieve best results. You need to go patiently through this selection phase guided by relevancy criteria. You should start by using Google search. Type the keywords from your list to the search bar and explore the results. Pay attention to the type of ads that are shown in the result, as those are the ads you will be competing with. Pay attention to the organic results. Those results are most likely to be shown when the users search for those keywords in the search engine. This means that you will be competing for the organic reach, with the websites you see in the result page. Finally, you should explore the related searches in the bottom of the page, as those might help you with modifying the keyword phrases or adding a certain word as a part of the phrase. The second step consists of using Google Keyword Planner. 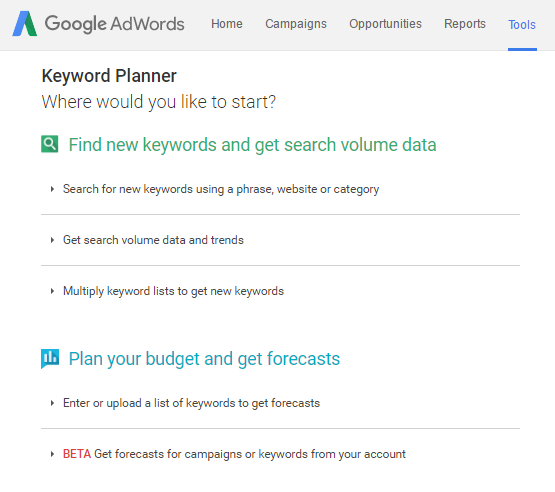 This tool is available from the Google AdWords account, or you can use this link to access it: https://adwords.google.com/KeywordPlanner. You do need to be logged into the Google account to be able to use this tool. Since this is a free tool, you can use it for keyword research in both paid advertising and search engine optimization. There are several options to explore keywords, but one of the most useful options is the one helping you with keyword ideas – Search for new keyword. This option can help you explore the keywords that might be included in your keyword list, as well as the keywords that might be added to the negative list. If you notice that a certain word is frequently associated with your keyword, but you know that those will not result in conversions, you should add the word to the negative match. When you click on the first option to search for keyword, you will see the following settings. 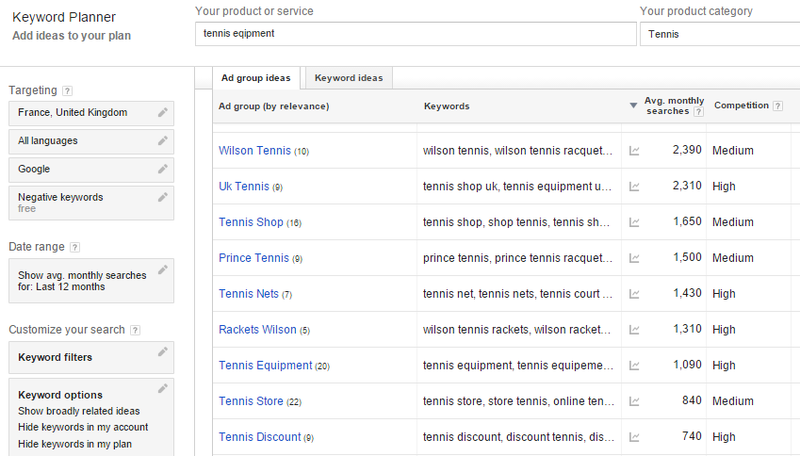 In this example, we have used “tennis equipment” for products, and “tennis” as product category. Targeting options are set to France and UK as location, and negative keyword is “free”, which means that this word will be excluded from the results. After you have entered all of the setting, click on “Get ideas”. Click on the column “Average monthly searches” in order to sort the keywords based on the number of searches, and then explore the ad groups and keyword ideas related to your product. Keyword Planner is also a good tool for determining long tail keywords. These keywords are longer phrases which are more specific. Although they receive fewer searches, these keywords are important as the click through rate is usually very high, and they are most likely to lead to a conversion. 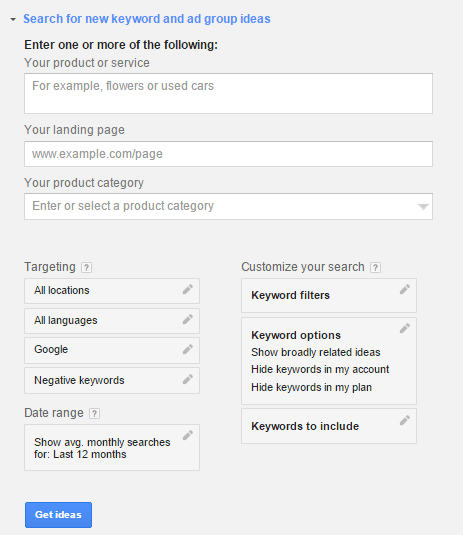 Using Keyword Planner might be a good way to see the suggestions offered by Google, in order to compare the keywords. However, you should not completely base your campaign on the usage of these suggestions, as after all, you are the one who knows your business best, and you are able to make a decision without relying absolutely on a tool. Besides the keywords that should be added to your AdWords campaign, which basically are the words that trigger your ad to appear in the search results, you should also add negative keywords, which will have opposite effect. Negative keywords will prevent your ad to be triggered by the keyword or phrase that is labeled as negative keyword. 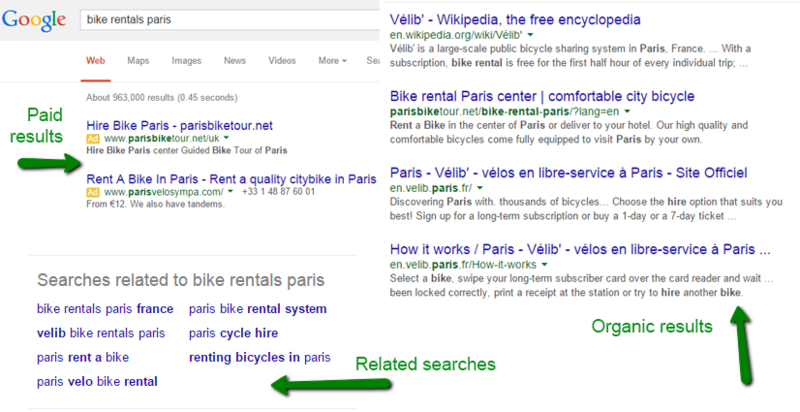 In this case, Google will not show your ad when the negative keyword is used in the search query. The usage of negative keywords is very important as they can help you control who is able to see your ads, and it also gives you more precise control over your costs. This way you are able to eliminate all the keywords that will not lead to conversions, which increases CTR and reduces the average costs per click. When making a list of negative keywords, you should be very careful and conduct a research, just like with the regular keywords list. This means that you will start by brainstorming and developing a list of keywords that are unlikely to convert. Use Google search and Keyword Planner to help you compile a negative keyword list. 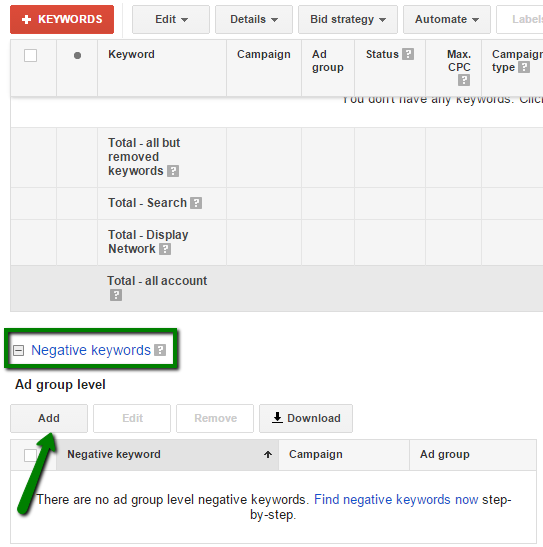 Negative keyword will prevent Google from displaying your ad, so be very careful when labeling a keyword as negative. Be careful not to use the same keyword in both lists, as regular keyword and as negative keyword. The same list of negative keywords can be used for multiple campaigns, as well as for different types of Google advertising. After your keyword research is over, after you have gathered the list of keywords and long tail keywords, as well as the list of negative keywords, you will have enough data for setting up a campaign, or using those in search engine optimization. When working on keyword research, you will not find exact rules related to keyword usage, but there are some general recommendations you should follow in order to maximize the effect of those keywords. Relevant keywords – You should be very careful to choose only the keywords that are relevant to the campaign, and that can be associated with the campaign, your products, or the landing page. Use adjectives to narrow down the keyword in order to increase relevancy, as using too generic keywords may be counterproductive. For example, if you sell bikes, you do not want to reach people who are looking for motorbikes and bikes for children. Using additional words in the keyword phrase will help you be more specific when describing your products. Keywords grouping – AdWords campaign consists of group of ads. Each group of ads has a keyword group assigned to a particular ad. When grouping keywords, you should try to associate the keywords with the theme of the ad and products displayed in the ad. The right number of keywords – There is no strict rule on how many keywords you should use in the campaign, as it depends on the individual campaign. Most advertisers use between 5 and 20 keywords in one ad group. Use keyword matching types – It is important to use the keyword matching types to help you target the audience and maximize the efficiency of certain keywords. Choose negative keywords carefully – When choosing negative keywords you should only add the keywords for which you are absolutely sure they are not going to result in conversion, as otherwise you might be reducing the efficiency of your ads. You should always have in mind that if the keywords used in the search query is in your list of negative keywords, your ad will not appear for that search query.